Why should a piece of music only breathe in its original instrumentation? 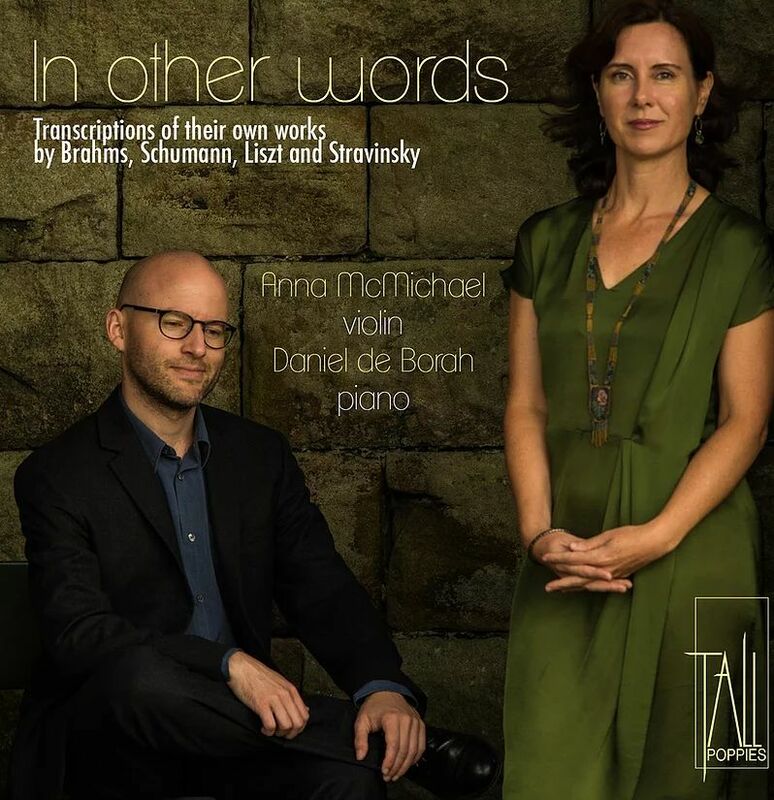 This is the theme underpinning violinist Anna McMichael and pianist Daniel de Borah’s new release In Other Words. It’s an album entirely of transcriptions. Its beauty lies not only in the remarkable works themselves – from the lightness of Stravinsky’s opening Pergolesi fragments, to Liszt’s lingering Romance Oubliée – but in the stories it shares. Throughout are scattered intimate tales of these works, deepening our understandings of the composers’ tastes and choices. Well-paced statements from McMichael encourage us to reflect on each line. It’s not an album that has a sense of rush; the duo is in no musical hurry to showcase virtuosic ego. Each phrase becomes one to relish in composition, transcription, and presentation alike. A favourite is Brahms’ E Flat Sonata, to which we hear de Borah’s tastefully powerful piano melodies come to the fore. Though the gritty and very much alive Danse Russe by Stravinsky is a close contender. I had first encountered a transcription of Schumann’s Three Phantasiestücke – originally for clarinet – as a student of classical saxophone! But here it thrives in the flowing and sweeping lines of McMichael, perhaps suited to this instrumentation best of all. Whether you’ve heard these works before in any form, this album is a stand-out. Read the stories and listen mindfully. Little and Lane prove ideal partners for a middle ground Brahms survey. Did You Hear About Brahms’ Musical Feud With Wagner? The twin titans fell out of bromance thanks to a withheld score and a milliner’s letter. This Appl didn’t fall very far from Fischer-Dieskau’s tree. In Brahms, the best is the enemy of the good. A Canadian’s tribute to Glenn Gould fairly hums along.